The following list identifies league finals results and breaks out the varsity boys and girls individual champions. Congratulations to all the individual league champs!!! Course distance and subsequent notes are added where available. We welcome email submissions of additional historical notes for updates of this article. Also, please let us know of any corrections and/or league results that are missing by emailing a results link to jeffrey.parenti@flosports.tv. This article is updated through league finals posted on or before Nov. 3. League finals are listed alphabetically by date. CIF section is indicated. Girls: Sally Silengo (Kennedy, Jr.) 18:59.70. Note: Murillo also won as a junior and was 2nd as a sophomore. Note: Karperos was 2nd each of the previous two years. Note: Staley also won as a sophomore. Notes: Gee also won as a sophomore (18:09) and was 4th as a freshman (18:02.30). Briscoe was 2nd as a sophomore (15:29.80), and 9th as a freshman (16:14.50). Note: Strangio also won as a sophomore. Notes: Ramirez was 2nd as a junior (17:10.40), 4th as a sophomore (17:40.50), and 4th as a freshman (18:50.60). Martinez was 3rd as a junior (14:53.40), 6th as a sophomore (15:21.80), and 13th as a freshman (16:41.10). Note: Suarez also won as a freshman. 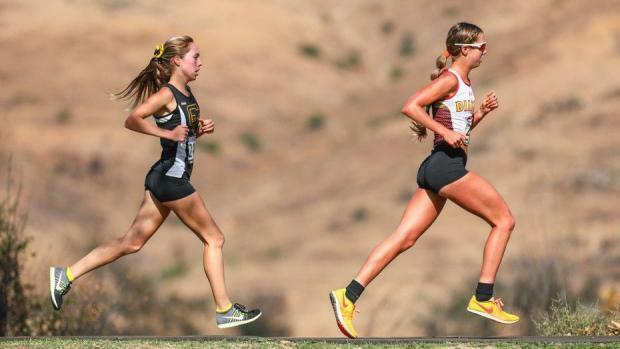 Girls: Hannah Konkel (Laguna Beach, Sr.) 17:37.70. Notes: Garcia had previously won the last two Sunset League titles, making this a third consecutive Sunset crown. Note: McLaughlin was 14th as a junior (17:03.00). Notes: Laubach also won as a junior (17:34.47). Harper also won as a sophomore (19:31.01). Note: Molina also won as a sophomore (17:20.90) and was 4th as a freshman. Note: Delgadillo also won the Arrowhead League title for the fourth year in a row. Notes: Duarte won as a freshman (17:44.6). Rehfeldt was 3rd as a junior and 10th as a sophomore. Notes: Pearlman was 5th and 20th each of the previous two years, and Funk was 3rd and 6th. Note: Hoak was 2nd as a junior and 6th as a sophomore. Note: Orosky was 2nd as a sophomore (15:59.41) and 14th as a freshman. Notes: Rodriguez and Guijarro each won for the second year in a row. Notes: Browne won and Orozco was 2nd in 2017 when their schools were in the Inland Valley League. Note: Hibbard also won as a junior (15:29.20). Note: Ramos was won as a junior and was 2nd as a sophomore. Notes: Knutson won as a junior (15:04) and was 5th as a sophomore. Lowengrub was 4th as a freshman (17:54). Girls: Melissa Flores (Bellflower, Jr.) 19:47.50. Notes: Duenas won for the second year in a row; she was 6th and 7th each of the previous two years. Note: Ceja was runner-up the last two years. Note: Lopez, 11th as a junior, dropped 59.20 seconds from his 2017 time. Notes: Sullivan won as a freshman, was 2nd last year. Note: Gonzalez won for the second year in a row. Note: Gonzalez also won in 2017. Notes: Gomez also won in 2017 (18:42.70) after being 9th as a freshman (19:28.90); Patel was 17th as a sophomore (16:46.60). Girls: Lauren Harper (Trinity, Sr.) 20:54.00. Note: Harper also won in 2017. Notes: Fuller (14:23.68) and Hines (16:46.03) both placed 2nd as juniors. Fuller was 17th as a sophomore (15:27.20). Hines was 20th as a sophomore (18:55.10). Girls: Tori Gaitan (Great Oak, Jr.) 16:54.50. Note: Solis won as a junior and was 6th as a sophomore. Notes: Barrett also won in 2017. Yamada defeated 2017 champ Kentaro Vadney, runner-up here, by 30 seconds. Notes: Giannini won for the second year in a row (he was 3rd as a sophomore). Osborne won after placing 2nd as a junior. Notes: Both Danforth and Kirsch placed 3rd in 2017. Kirsch won after placing 3rd each of the last two years. Notes: Young defeated teammate and defending league champion Jace Aschbrenner, the league runner-up, by more than 23 seconds. Notes: Tecanhuehue won after placing 9th each of the last two years. Castillo-Davidson was 4th in 2017. Notes: Madrigal won for the second year in a row. She was 5th as a sophomore and 8th as a freshman. Note: Gaddy also won in 2017. Note: Anderson also won in 2017 (15:36.00). Notes: Weber was 2nd and Roehling was 5th in 2017. Note: Larabaoui was 2nd to eventual State Division I champion Justin Hazel at the 2017 final, 18.40 seconds behind on the Pierce College course. Note: Chittenden placed 3rd and 8th the previous two years. Notes: Duncan and Ashby both repeated as champions. Notes: Tabrizi won for the fourth year in a row. Grover won for the second year in a row. He was 3rd as a freshman in 2016. Note: Mokkapati won for the second year in a row. She was 5th as a freshman. Notes: Terdiman won for the second year in a row. Notes: Norris won the for the second year in a row. He placed 2nd as a sophomore. Stanziano won after placing 2nd as a junior and 4th as a sophomore. Note: Maselli defeated teammate and 2017 champion Colleen McCandless by more than 20 seconds. Note: Barnett won for the second year in a row. Notes: Padilla and Dixon both won for the second year in a row. Padilla was 6th as a sophomore. Notes: Duby was 15th (21:00.10) and Ali was 3rd (16:30.49) in 2017. Notes: Perez won for the second year in a ro.